Softcover. 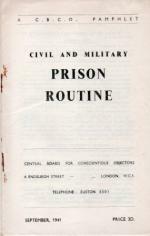 A Central Board for Conscientious Objectors pamphlet(CBCO) which describes imprisonment and detention under : Civil Prisons (Remand Prisoners and Convicted Prisoners) and Military Detention Barracks (Remand Prisoners and Convicted Prisoners). 20pp. 8vo. stapled (sl. 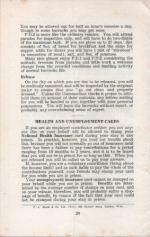 rusty) pamphlet which has an impercptible vertical crease where it has been folded at some time. Vg+ with no tears. Extremely scarce.